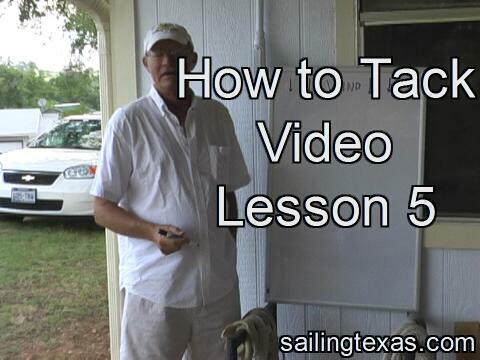 How to tack is very important when sailing, expecially sailing upwind. The procedure for tacking varies depending on the speed of the wind, the size of the waves, and the speed and weight of the boat. Practice in different conditions really helps, but certain things always work. Moving the tiller smoothly and not stalling the rudder is important, and having sufficient boat speed is also important. If you try a tack and don't make it, do not just think you made a mistake, but instead notice what the boat did and what you did to make it stop. You may want to do the same thing when coming to a dock! Here Dieter demonstates how to tack the Flying Scot single handed in fairly good wind of 10 to 15 mph. The jib sheets have been routed back to the spinnaker blocks so he can reach them while at the tiller. Note how he stopped the turn before the tack was completed, you can tell because the mainsheet remains loose while he gets the port jib sheet adjusted. Click the play arrow to see How to tack the Flying Scot singlehanded. Clicking on this picture opens a new page with 5 videos showing Martha learning to tack well in the two day class. The first 4 videos show various things she can improve on, while in the last video she does everything right. Close window to return here. Brook shows how to tack the Scot in light wind. Only 7, she was a good student who knew what to do and when. 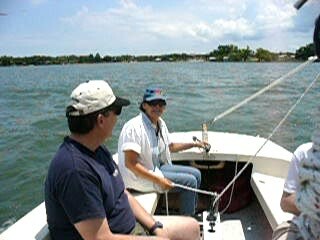 She uses the tiller extension, and changes sides at the right time, and stops the turn when the sail fills. Tacking a Hobie or other small catamaran is a little different. Many people have difficulty completing the tack, usually because they move too soon. Here Mike shows how to tack successfully, staying on the starboard side to help the boat turn right. The lower pontoon has more drag, so to turn right it helps to stay on the starboard pontoon, the opposite effect of a monohull where more weight on starboard makes the boat want to turn left. This last tacking video shows me make two normal tacks, and then two "hands free" tacks where I let the Flying Scot tack twice by herself. No human intervention on tiller or mainsheet during the two tacks, this is possible in the Flying Scot with the right windspeed, the mainsheet set properly, and the centerboard at the correct position. This shows the power of the weather helm when sailing with just the main, the board down, and the boom at about a 45 degree angle from centerline. The boat will turn into the wind and tack, then returns the tiller toward the center to stop the tack. Weather helm is the tendency of a sailboat to turn into the wind when released. Not all boats have weather helm, and there are many ways to adjust the balance of the boat and thereby the amount of weather or lee helm. Lee helm is a tendency of the sailboat to turn downwind when released. Not safe like weather helm, lee helm causes bearing off and more heel.